ID: Long, slender plated body with narrow snout. Usually green in color. Comments: I rarely note the magnificent bay pipefish. When I do, it is in amongst eelgrass where it is perfectly camouflaged. 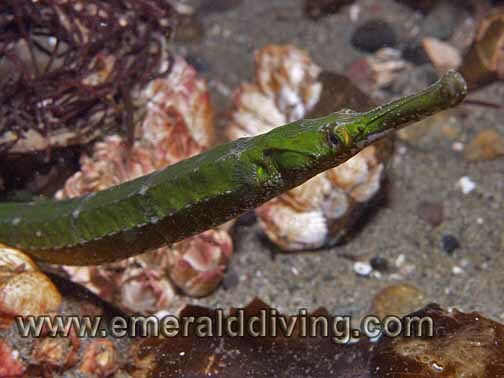 The bay pipefish is related to the sea horse - in fact it resembles a sea horse that has been straightened out. ID: Golden-brown body, yellow dorsal and caudal (tail) fin. Black spot on front dorsal. 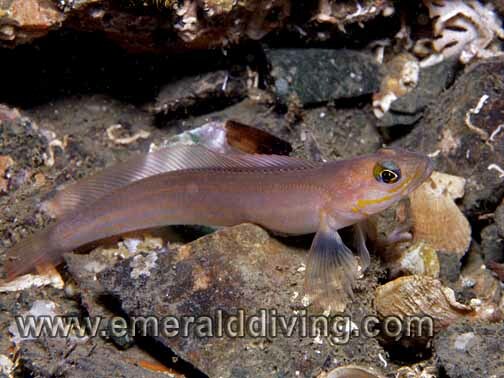 Comments: The blackeye goby is a common dive companion in most Washigton waters - especially Hood Canal. This fish usually stays very close to a small crack or crevice and quickly withdrawls when approached. I have noted some specimens that are less golden brown and more silver in color. ID: Long, slender body. Single dorsal fin with soft rays. Yellow markings on head below eye and along body. 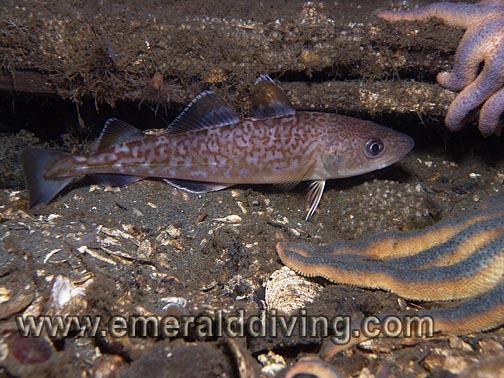 Comments: The northern ronquil is similar to the blackeye goby in that it never strays too far from a crack or crevice to which it will quickly retreat when approached. 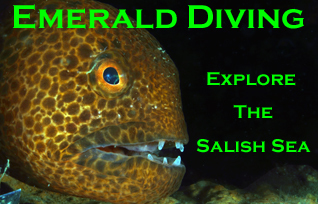 I often note this species in northern Puget Sound, Hood Canal, and the San Juan Islands. ID: Golden-brown top, white belly. Unusual eyes with very small pupil. Row of small luminous spots along side of body. Upturned mouth. 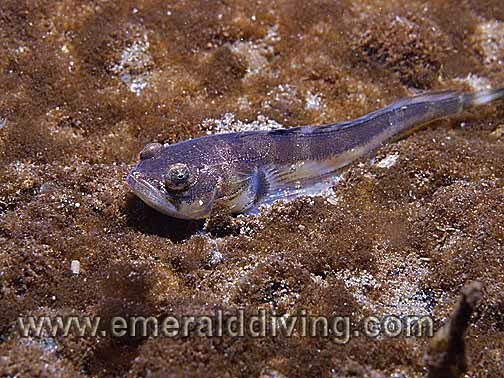 Comments: I normally note the plainfin midshipman partially buried in the sand or hovering motionless in the water column at night as it attemtps to attract prey without becoming prey itself. 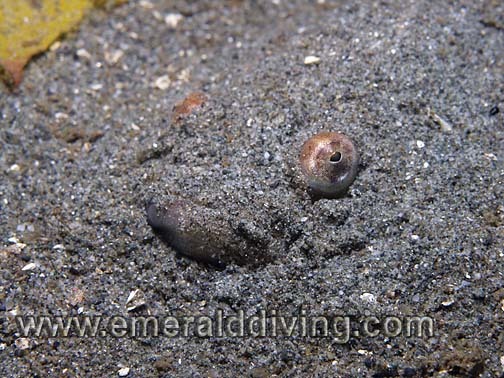 Plainfin midshipman lay eggs on shallow reefs, which males will relentlessly defend until they die. ID: Elongated, very narrow body. Narrow snout. Usually gold on color with white markings. Comments: I commonly note the distinctive tube snout in shallow waters (less than 20 feet) around eelgrass beds. 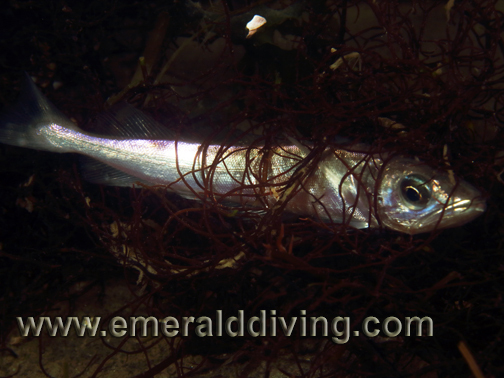 Males turn black during mating season and sport orange pelvic fins which they �flash� at potential mates. ID: No barb under chin, three separate dorsal. 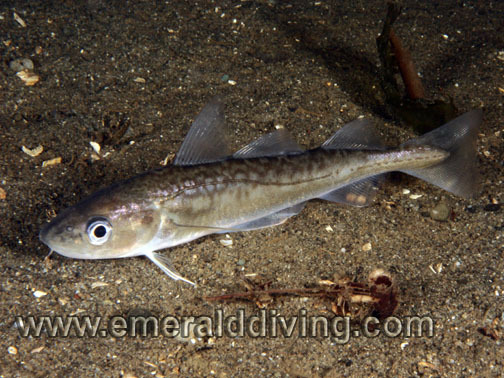 Comments: Although adult walleye pollock can grow as large as 36�, I only note juveniles when diving. During winter months, these fish tend to move into depths as shallow as 80 feet at night where they sleep close to the bottom. 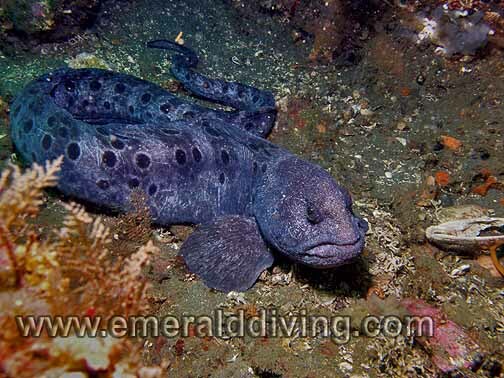 ID: Long, eel-like body, large pectoral fins, bulbous head (espcially males). Blue to grey/white color . Comments: Another of the Northwest icons, I note wolf-eels through Northwest waters, although they are not overly common. Wolf-eels prefer areas subjected to current with nearlby food sources (urchins, crabs, octopus), and well protected dens. Female pictured. Photo taken at Waadah Island Fingers near Neah Bay. ID: Long, eel-like body, large pectoral fins, bulbous head. Orange/brown color. Comments: Note the drastic color difference between this young adult and the mature female pictured above. Finding a wolf-eel completely out of its den is a rarity - most encounters are as pictured here - a curious wolf-eel sticks its head out of its den to investigate the noise bubble blowing visitor that is wandering by. Photo taken at KVI Tower reef in Puget Sound. 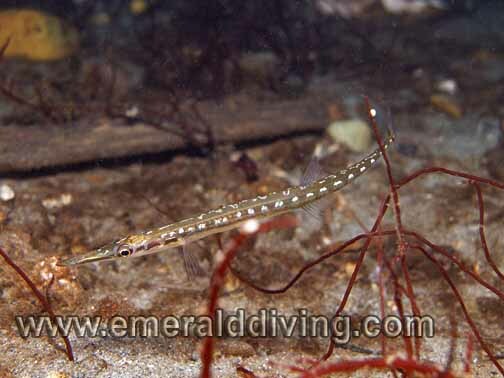 ID: Slender and smoooth body with rounded pectoral fins. Black underside of belly, Males have an elongated snout. Black spot at front of dorsal. Comments: This interesting little fish is supposedly common, but I very rarelty note it. 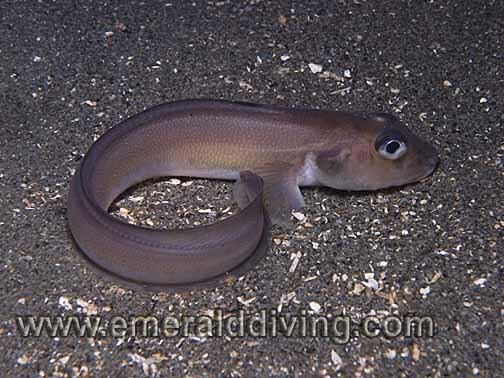 The blackbelly eelpout supposedly moves into shallower (within recreational diving depths) at night to feed. I found this lone specimen at Three Tree Point in 95 fsw. Female pictured - males have a longer snout. ID: Three topside fins, included a rounded first doral. Rounded nose with a single whisker under the chin that is about as long as the fish's eye is wide. Comments: Pacific cod used to thrive in Puget Sound, but overfishing and habitat destruction have made sightings a rarity. 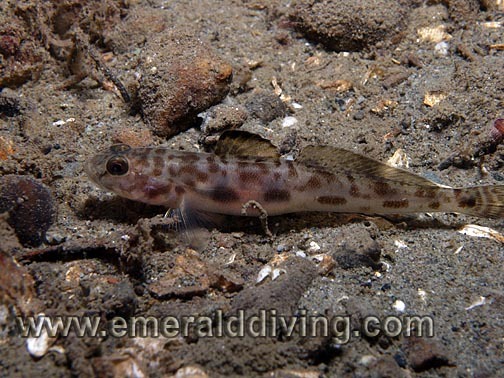 Pictured is a juvenile Pacific cod shoing off a gorgeous mottled color pattern on its body. Photo taken at Three Tree Point in 90 feet of water. ID: Small scales, black band on top of dorsal. Mottled brown color. 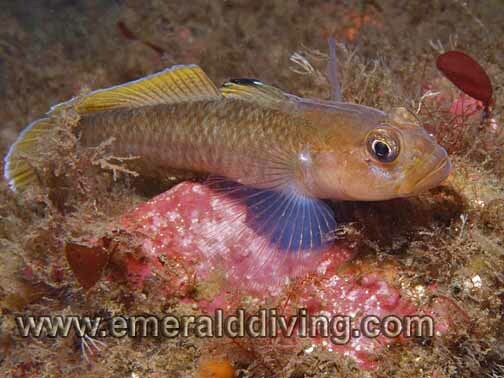 Comments: I rarely note this little goby as it prefers muddy or silty habitats, and I refer to dive rocky reef. 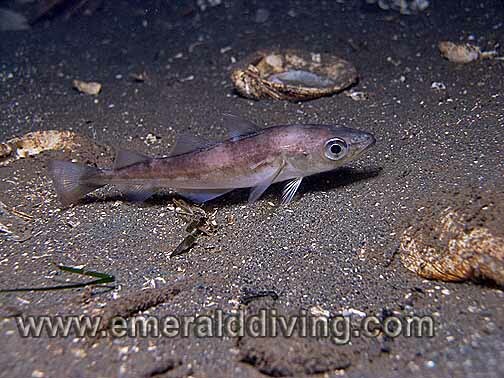 This little fish is usually not found too far from a protective den where it often retreats to when approached. Photographed in Elliot Bay. Comments: This is typically what a plainfin midshipman looks like as it lays in wait buired in the sand. 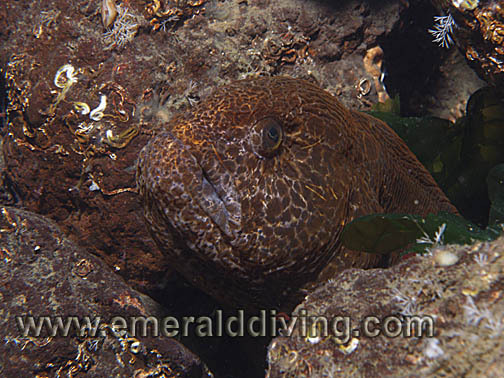 As you might guess, it is often overlooked by most divers. Photograph taken at Three Tree Point in central Puget Sound. ID: large, flat head with sucker-disk on underside. Typical bar between eyes. Comments: I rarely note this little inconspicuous fish. The biggest northern clingfish I have seen are about 3' long in Elliot Bay. This ID shot was taken at Sekiu Jetty. 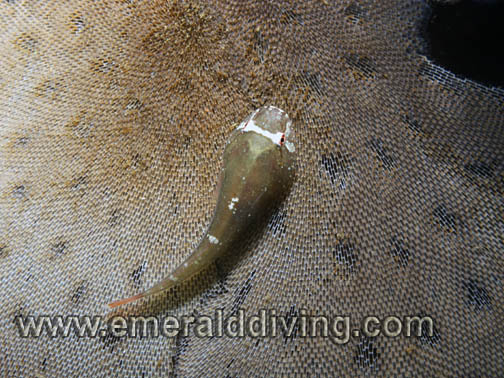 I readily found clingfish on the bryozoan attached to the kelp, however they were all only about 1" long. ID: Three topside fins, included a pointed first doral. Rounded nose with a single whisker under the chin that is only about half as long as the fish's eye is wide. Comments: These small cod often show up around Three Tree Point in winter, which is where this photo was taken. I observe then on night dives "resting" just off the bottom. Often confused with walleye pollock that inhabit the same waters. Walleye have a bigger eye and no whisker under the chin. ID: Two dorsal fins topside, first dorsal defined and triangular, second dorsal long and notched. Silver reflective scales. Comments: I rarely not this fish in Puget Sound anymore - they used to be much more common but have been overharvested. Photograph taken on a night dive at Redondo Beach in 75 feet of water. The hake is resting at night on the bottom amongst seaweed for cover. Yes, fish do sleep!